I'm not going to sit here and brag about how open-minded I am about new foods, because I've already done that plenty of times before on this blog. But I feel I must set that precedent before I say something controversial like, "I don't like anything with blue cheese" because otherwise people assume I'm a lame, close-minded 'Murican who only eats hamburgers and freedom fries. Sonia doesn't like blue cheese either. Do you know what the blue stuff is? It's mold. Aside from having a nasty mold allergy, I mean, that's just gross. If we were meant to eat mold, many of us here on the soggy east coast would have a never-ending food supply in our basements and crawl spaces. But no, we do what we can to get rid of that mold. We banish it. We send it back to the dark recesses of whatever sinister realm from whence it came. We don't eat it. But somehow if there's cheese surrounding it, it magically becomes ok. I don't get it. You know what else I usually don't like? Brie. Now here's where Sonia and I differ. She loves it in all its glorious forms and in almost any context. Most people I know like brie. They gather around the hors d'oeuvres table to sing its praises at fancy shindigs and they stop talking to me when they find out I don't like it that much. Now why, you ask, would I buy a product that so prominently features brie if I'm not an avid fan? Honestly, I was thinking of my wife. On certain uncommon occasions, I am able to remove my head from my posterior and have thoughts that center around someone other than myself. That's what happened here I think. That, and sometimes I like to try things that I didn't like in the past just to see if my taste buds have changed or if my initial assessment may have been inaccurate. So far, I have only had brie that sat well with my palate once: this TJ's dish. And I think that's because it was melted. I'm not saying I would have minded if it were mozzarella or cheddar or something less exotic, but brie worked here. It was amazingly creamy. And flavor-wise, brie goes really well with asparagus, apparently. And I've always liked asparagus. Who knew they worked well together? 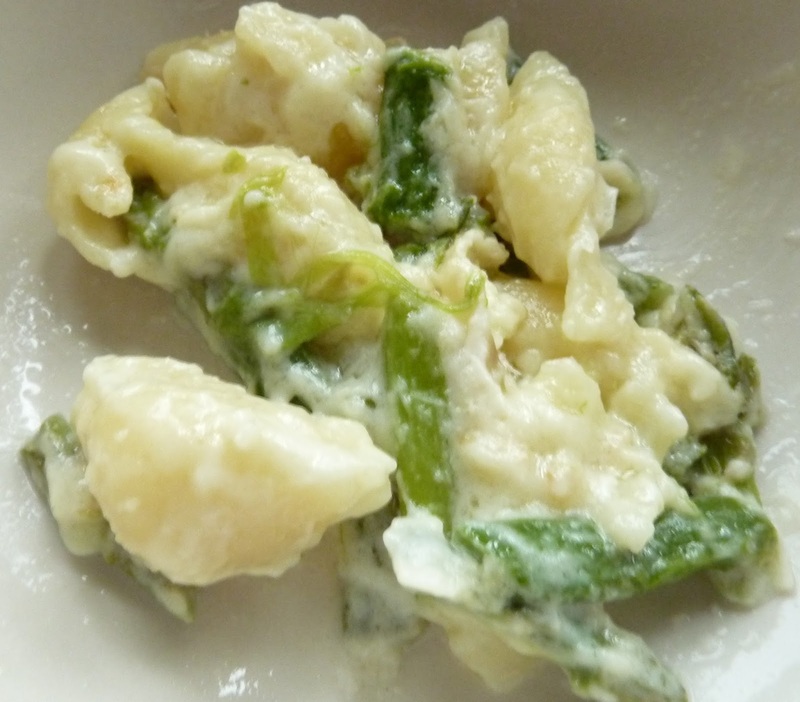 The "conchiglie" pasta was fairly run-of-the-mill shells, but perhaps a bit on the larger side. The texture of the asparagus was excellent. Not stringy at all. Although, I must point out that we cooked this dish on the stove top, not in the microwave as indicated by the heating instructions. Our power was out during one of those freak storms we had last week so we decided to heat up some of the perishables before they got too thawed. I figured out that the ignition doesn't work on our stove top when the power is out, but we still get gas, so I have to turn on the gas and then ignite it with a lighter. I usually draw out a bit too much gas and lose a few eyelashes and a portion of my goatee in the process. But hey, with great risk comes great reward. Sonia wishes this product came in a larger size. She gives it 4 stars. I liked it, but I'm still not a "brie guy" yet. So 3.5 stars from me. I too love Brie... but I would never buy this.. TJ must of been having a slow day in the creative dept... when I saw the title I had to stifle my gag reflex..
lol...not a fan of asparagus? very funny! lol....wonder if they use the lousy grade of brie? Why would this make you gag? Good point, TH. I guess I just have a personal hangup with blue cheese...when I'm eating other stuff, I just don't think about it. 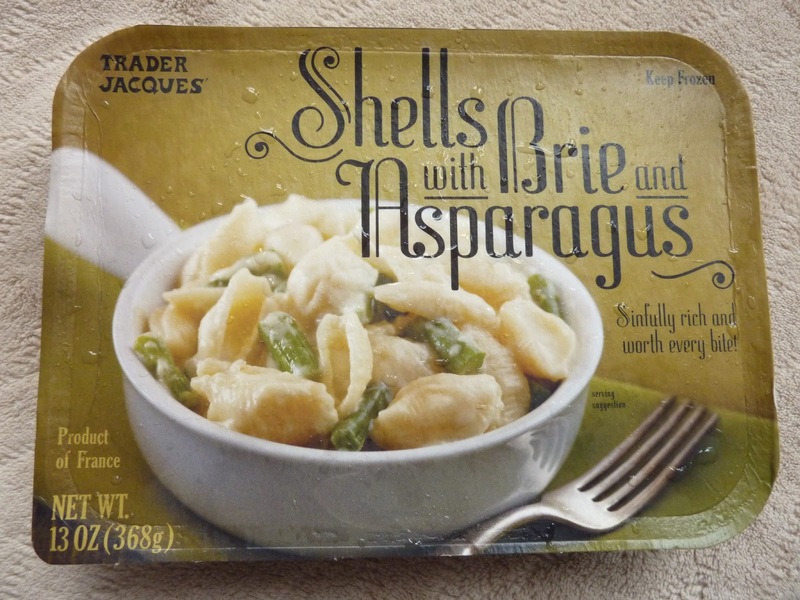 The shells and brie are fine but the asparagus has the taste and texture of rope. This meal with brie and shells is wonderful! My asparagus was not stringy at all. I actually baked mine in the oven,( not microwave or stove prep), and the chunk of brie at the top melted and browned perfectly and everything baked golden and nice. Stirred it up and added black pepper and a dash of salt. This is worth it. Worth the calories. I think it could be even better if next time I added a bit of goat cheese also! 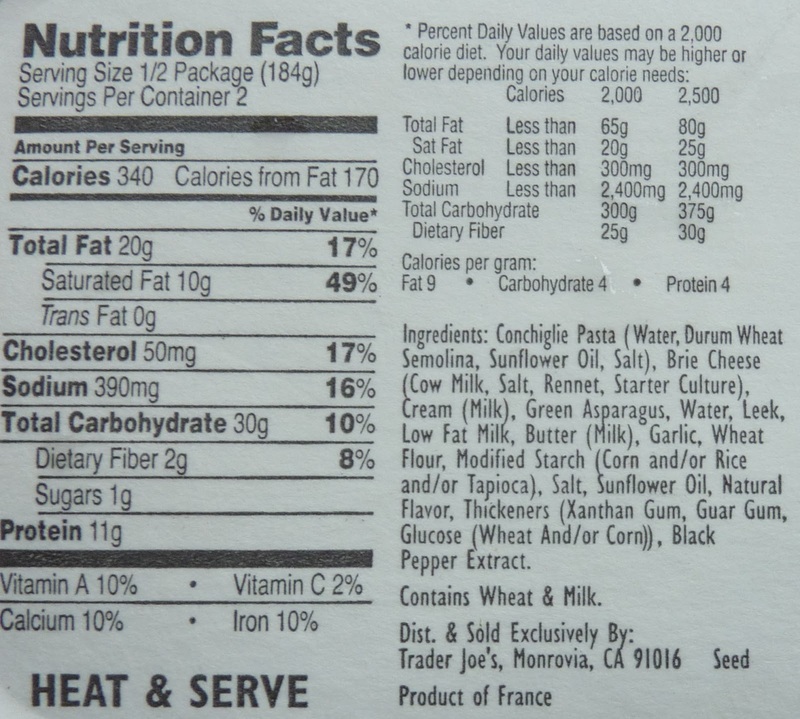 Delicious, perfect size, read the calories! Thanks again Trader joe staff!